Tech Swiss offer a full line of premium quality replacement watch bands. The strap featured is a genuine Italian Calfskin leather, buffalo grain matte finish, padded, silver-tone polish finish Stainless Steel buckle, Mens-standard length, soft Nubuck leather lining with lining continuing under buckle, slightly tapered cut and white sporty stitching around band for durability. 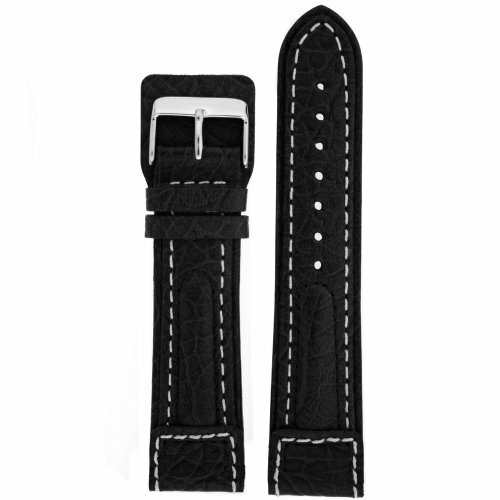 The watchband is available in sizes 18mm, 20mm, 22mm and 24mm. Tech Swiss offers a full line of watch bands in calfskin leather, crocodile, alligator, lizard, ostrich, shark and sting-ray. We have a wide range of straps in many lengths in including Mens-standard, Ladies-standard, Long, Extra Long and XXL Long to meet your needs. Tech Swiss only uses the highest quality of materials including superior soft Nubuck and genuine leather linings. Our construction of the bands feature reinforced stitching around the band. We offer many combinations of styles, designs and buckle finishes that are all Nickel Free. All of our straps include Stainless Steel spring bars. We are confident you will not find a larger selection of leather watchstraps in colors, sizes and lengths on the market. To determine the size of watch band, see provided image. Length: 3 1/2" on the buckle side including the buckle 4 1/2"